Now, let me get this out of the way. I'm not a student of Elizabethan history and know only about the Virgin Queen, the victory over the Spanish Armada, and Sir Francis Drake on a very cursory level (High school history classes lost in the mists of time.) More interesting to me was the conflict between Dudley--the younger of the two, dashing, impetuous-- and Cecil--older and more cunning and how their rivalry for Elizabeth's affections and favours were manifested in the building of their fantastic gardens. I use this adjective because fantasies were created and brought to life in the pleasure grounds for Elizabeth's delight. The Elizabethan garden was many gardens in one, composed of mazes, wild hunting grounds, terraces, herb gardens, knot gardens, outdoor theatres and pools. It drew much inspiration from the Italian Renaissance gardens of the day at Villa d'Este, Villa Lante and Villa Medici. The gardens at Kenilworth and Theobalds, long ago destroyed by Elizabeth's successors, were magical places where Elizabeth would enjoy feasts pageants, plays, fireworks, and mock-sea battles (among other activities) held in her honour. They were also places of intrigue, mystery and of assassination attempts! Elizabeth was, apparently, also a lover of horticulture and at Theobalds, we are introduced to the famous "herbalist" John Gerard. He was also a physician, pharamacist, and horticulturist to royalty. I learned that certain highly-scented flowers were symbols of love and devotion like the rose and the "gillyflower" or carnation and planted expressly so that Elizabeth could appreciate their scents. Herbs like hyssop, lavender and rosemary were grown for culinary and, ahem, personal hygiene applications. The growing of lemon and orange trees was reserved for royalty and was unknown and out of reach to the public given their rarity. Martyn weaves history and horticulture together with Elizabeth connecting everything and everyone together. In many ways, modern gardens commissioned by the wealthy are still outward expressions of power and status and that hasn't changed since the Egyptians. But along with the power, the Elizabethans knew how to have a good time! Anyone else interested in reading about history and horticulture in the same book? Can you suggest some good titles? 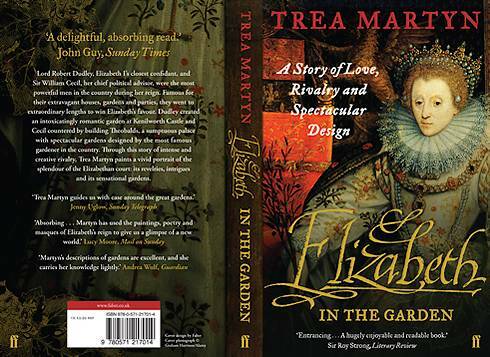 A book review of Trea Martyn's "Elizabeth in the Garden" by Paul Jung, owner of a Toronto organic and ecological gardening services company. Published by: Faber And Faber Ltd.